We have taken a leadership role in several community – wide programs. 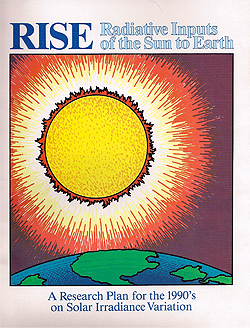 We initiated the RISE (Radiative Inputs of the Sun to Earth) Program at the National Science Foundation. Our aim was to provide scientific coordination and funding for ground – based and theoretical studies of solar irradiance variation. We envisioned RISE as a community – wide complement to space – borne measurements of the solar irradiance supported by NASA and NOAA. The founding Steering Committee consisted of G. Brueckner (NRL); P.Foukal, CRI (Chairman); H. Hudson, UCSD; W. Livingston, NSO; R. Noyes, Harvard; and R. Roble, NCAR. A first workshop was held at the National Center for Atmospheric Research (NCAR) in Boulder, CO, in November, 1987. Its success led in 1990, to a formal research plan proposed to the National Science Foundation, with a total budget of $11.1M. The program was accepted by the NSF in 1991, and continued to provide funding through 2004. A key part of SunRISE (its eventual name) was the development and operation of a network of Precision Solar Photometric Telescopes (PSPT’s). The PSPT working group, chaired by P. Foukal, provided a concept design and the project was passed on to the National Solar Observatory for detailed design and fabrication. 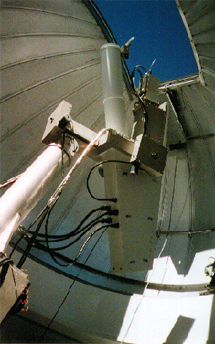 Three PSPT’s were built; one at the Rome Observatory in Italy has been in operation since 1996. Another (see figure at right) has been operated at Mauna Loa, Hawaii, since 1998 under the auspices of the High Altitude Observatory of NCAR. The third is kept as a spare at NSO. Besides SunRISE, we have organized numerous workshops and special sessions of the Solar Physics Division of the American Astronomical Society (including the first AAS poster session, at the 1977 meeting in Atlanta, GA), and of the American Geophysical Union. 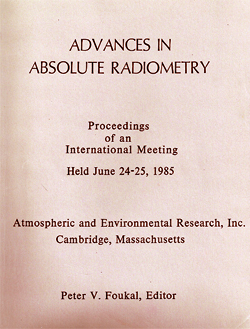 A particular success was the first workshop on “Advances in Absolute Radiometry” that we organized in Cambridge, Massachusetts in June 1985. This brought together a mix of about 35 laboratory metrologists and solar and atmospheric physicists from around the world. Later named “NewRad”, it has since become the premier international radiometry meeting, attracting over 200 participants triennially to host national labs like NIST, NPL and PTB. The most recent NewRad was held in Tokyo in 2017. We have also served as member or chairman of numerous panels and committees of the National Academy of Science (NAS), of the National Science Foundation (NSF), and of the National Aeronautics and Space Administration (NASA).